Two peas in a pod. Cut from the same cloth. Peanut butter and jelly. 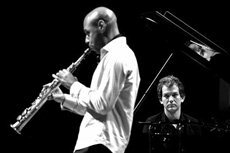 Use whatever fatigued cliché your heart desires, but none comes close to describing neither the synergy, nor the marked shades of difference, shared by saxophonist Joshua Redman and pianist Brad Mehldau. Born a year and a half apart on opposite sides of the country, these two prodigious musical lives first converged in New York City in the nineties, when they began testing their musical conductivity in Redman’s early quartet. As a son of the great Dewey Redman, Joshua doesn’t so much live in his father’s shadow as throw a light on it. Having been raised by his mother, he grew up a step removed from the legacy into which it is so tempting to place him. But Redman sees himself foremost as a listener, not a protégé, and it shows. Music has always been for him, quite simply, a release, the surest way to unmitigated expression. Mehldau is in no greater need of introduction, having ploughed a fertile sonic path whose lush crops bear little resemblance to those of a world filled with wilting farmlands. Whereas his recent Birdland live joint for ECM with legends Lee Konitz, Charlie Haden, and Paul Motian showed a penchant for sparkling and open paths, tonight he detoured into far more secluded glens. His notable flipping—playing ostinatos in the right hand and providing “bottoms” with the left—worked its selective magic on a couple of tunes, but for the most part flitted comfortably through the back alleys of expectation. In the long run, however, one wonders just how significant these biographical details are, for perhaps the best communication we can offer is the listening ear—one that hangs, suspended in the darkness of the concert space, and gives in return the voice of its appreciation, not speculation. Take Mehldau, for example, who has been much praised for his eclectic palette, which includes healthy daubs of jazz, pop, and classical alike. Yet these idioms, too, seem arbitrary when caught in the throes of the music into which they are blended. What matters is not where these paints come from, but that they share the same canvas. It was in this vein that, from those first few notes at the piano, the expanse of Bailey Hall collapsed under Mehldau’s touch, his right hand at full sail from the mellifluous and living wind of Redman’s tenor—so that by the time they reached their second number, the continent was already far behind us. Here, it was as if Redman had ended their last by drawing in a lungful of the tenor’s fog and exhaling it through this ballad’s cool, shipwrecked soprano, while hints of dawn flowered in the lovely, reflective trades on keys. As the music’s architecture intensified, “mesmerizing” was hardly the word. The following tune opened with a tenor lick so slick, there was no point in trying to stand upright. Though somewhat more fractured this time around, Mehldau found traction in a left-handed lead as his right adroitly negotiated two independent lines. After the crystalline highs of the soprano’s final appearance, Redman floated his signature tenor on a wave of velvety arpeggios. These haunting swaths of gorgeousness left us little prepared for an equally enthralling Nirvana medley, which showed Redman at his most animated, Mehldau at his most expansive. Night fell once more in their final piece, the piano lines of which had every mind attuned, and where Redman’s solo filled the hall with smoky caramel. The duo encored with a chromatic knot, unraveled with the utmost sincerity. Mehldau’s Brazilian influences crept through his soloing before bringing us back to shore via an amusing yet moving exchange with his partner. Titles were announced after the fact, but were unnecessary when in the presence of music that was nothing if not already sufficiently interpretable. Like air, their nourishment was invisible and ungraspable by the word, a sound-world in which multiplicity was the language of the moment. By the same token, one could hardly deny the conversational aspect of their playing, for at times details—an ascending motive here, a trill there—joined forces with downright clairvoyant synchronicity. And yet, whenever the two reconvened after their soloing, theirs was never a simple, obligatory recapitulation of the theme, but rather an evolved (and evolving) splitting of light into its hidden colors. 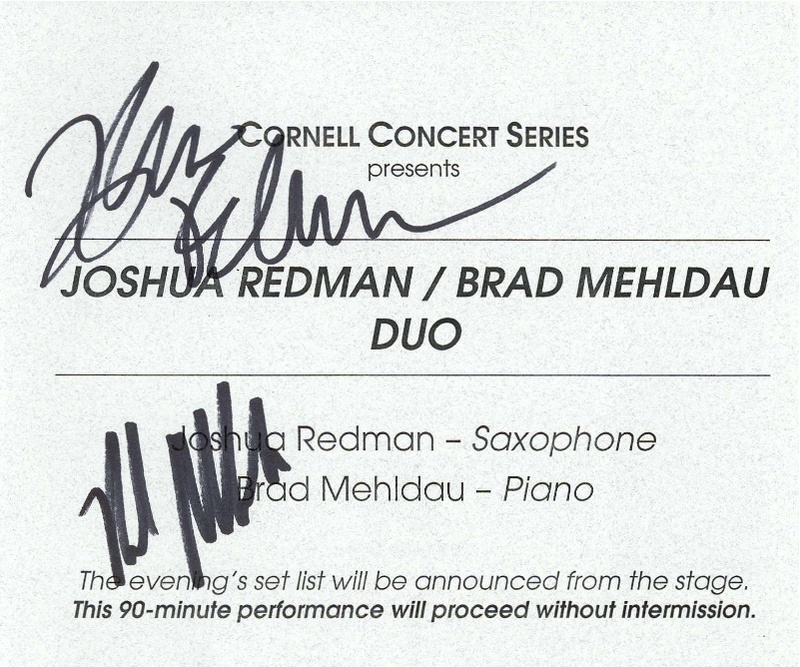 As a self-proclaimed “apolitical artist,” Redman creates a safe sonic space and, with Mehldau and others, has contributed significantly to his generation’s playbook. His is an ongoing conversation without walls, without message, without agenda. His genius lies in his humility, and in his openness to working with visionaries like Mehldau. And sure, all of the above may be dismissed as shameless pandering by the starry-eyed young listener and newly aspiring jazz saxophonist that I am…that is, unless you were there.